July 17th, 2012 | Welcome to Little Gull Marina! Welcome to the hottest day of the year….so far…. The lack of rain has finally caught up with us. After a few forest fires yesterday, there is a COMPLETE fire ban on. This means that no outside burning is permitted regardless of the purpose of the fire. The water bombers and ground crews were in working through the day and early evening yesterday to get the fires under control and are back working again today to make sure nothing is left. On a better note, the MDCA regatta is going to be on Saturday, July 28th starting at 1pm here at the marina. The fireworks will be around dusk on Saturday, August 4th on Beaver Lake. The second round of swimming lessons is on and registration is still open for the next session again here at the marina. 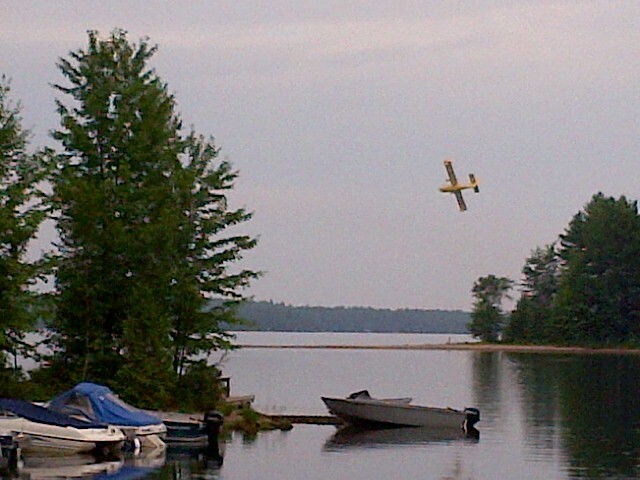 Today’s picture is a water bomber coming in for water on Mississagua Lake last night. Enjoy the gorgeous summer weather and stay safe.